One of the most remarkable characteristics about the stock market’s sell-off from its highs over the last three months is that all of the declines have come during regular trading hours. Basically, if the stock market has been open for trading (between the 9:30 AM ET open and the 4 PM ET close), investors have been selling. 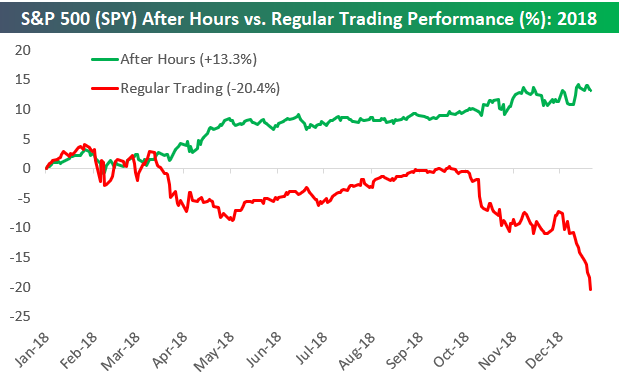 The way to track this is to look at how the S&P 500 performs inside of regular trading hours versus outside of regular trading hours. 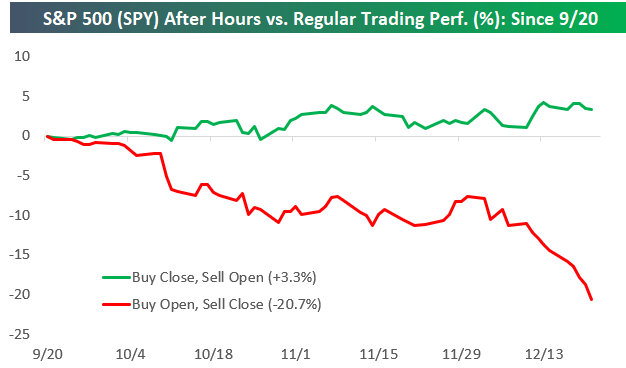 Since the 9/20 closing high for the S&P 500, had you bought SPY at the close of trading every day and then sold at the next day’s open (the after hours strategy), you’d actually be up 3.3%! Conversely, had you bought SPY at the open on every trading day and sold at the close that day (the regular trading strategy), you’d be down 20.7%. Based on these numbers, more than 100% of the stock market’s declines since the 9/20 peak have come during regular trading hours. The numbers are even more lopsided when you run the analysis on the two strategies for all of 2018. As shown below, you’d actually be doing very well this year if you only owned SPY outside of regular trading hours. Had you bought SPY at the close every day and sold at the next open, you’d be up 13.3% this year. Had you bought at the open every day and sold at the close, however, you’d be down 20.4%.